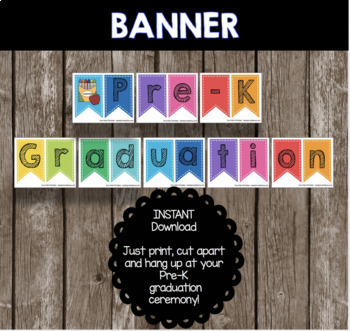 Everything you need for an adorable Pre-K Graduation! Please see product preview for additional photos. 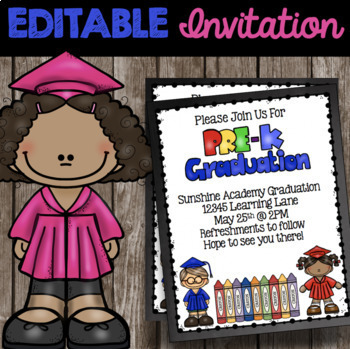 ★ Editable Pre-K Graduation Announcements/Invitations - simply type your info using Adobe 11 Reader. Print, cut apart and invite your students and families to attend the celebration! ★ Pre-K Graduate Sign - high resolution 8.5" x 11" PDF and 8x10 JPG - adorable photo prop! Use white card stock or photo paper for best quality. ★ Pre-K Memory Book - perfect keepsake for children to fill out and take home during the last week of school. Simply print and make copies for each student. ★"Watch Out Kindergarten! Here I Come!" Use as cupcake toppers or favor tags. ★ Editable Graduation Program - type out your school name, grade, date and all your ceremony details - comes in both color and BW. 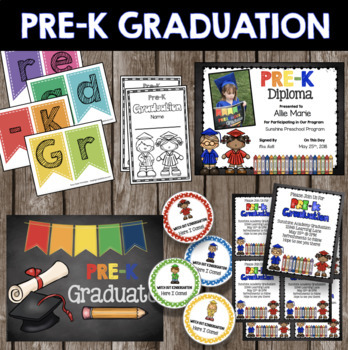 ★ Editable Pre-K Diplomas and Certificates - students and parents are delighted to receive personalized diplomas! Please see the photos in "Product Preview' for editable areas. ***UPDATED 2019*** Per request, these diplomas now come in both PDF and JPG formats, and you can add student photos to the JPG version! Please be sure you know how to do this, as directions are not included for the JPG files. ★ Graduation Mini Tents - four print per page and these are adorable for decorating your event and labeling foods, treats, student work, etc. This is an editable PDF file you will need to open in Adobe 11 Reader. Save money by purchasing everything in this one bundle! Some items listed in this bundle may be purchased separately, and some are only available with the bundle. For more details, please see the links at the top of this listing. You will need the latest Adobe Acrobat Reader 11 software. You can download Adobe Acrobat Reader for free at: www.adobe.com. Adobe will automatically match the font and size I embedded in the file. All you have to do is type what you would like it to say! Background and pictures are not editable. You can also change the color, style and size of the font if you wish. Basic directions are included in a separate PDF file in this download.